A series of short videos have been produced by the NASA Glenn Digital Learning Network featuring "Orville and Wibur Wright". 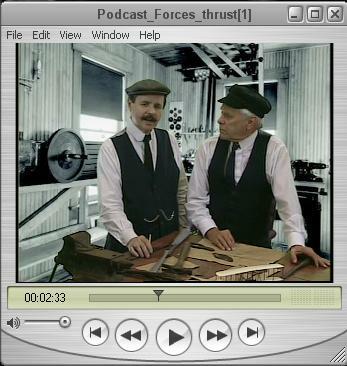 The brothers discuss many of the scientific topics that lead to the invention of the modern airplane. You can view the videos on-line, or download them to your computer or Podcast player for repeated viewing. Participants of NASA Explorer Schools Project 2003 have prepared presentations comparing the exploration process of the Wright brothers with NASA's exploration of Mars. Manned Mission to Mars A Power Point presentation prepared by the team from Lorain Middle School. From the Wright Brothers to Mars / Inquiry Zone A Power Point presentation prepared by the Crossroads Elementary School Team. Compare and Contrast A Power Point presentation prepared by the Southfield Public School Team (Southfield HS, Glenn Levey MS, Morris Addler ES). From the Wright Brothers to the Mission to Mars A Power Point presentation prepared by the Joyce Kilmer Elementary School Team. This also includes a play about the invention process. A Question of Place A Quicktime Movie prepared by the Anwatin Middle School (Byrn Mawr Elementary School) Team. Here are some presentations used by Tom Benson and Roger Storm from NASA Glenn Research Center in their portrayals of Wilbur and Orville Wright. Wright Brothers at Huffman Prairie A Power Point presentation prepared for the general public in October 05 describing the activities of the Wright brothers at Huffman Prairie from 1904 to 1905. Wright Brothers' Invention Talk A Power Point presentation prepared for the general public in Winter 02 describing the invention process of the Wright brothers from 1899 to 1905. Wright Brothers' Talk A shorter version of the Power Point presentation describing the invention process of the Wright brothers from 1899 to 1905. Contains only photgraphs taken by the brothers. Out of Control Talk A Power Point presentation prepared for students on 7 Apr 03 describing flight control and how flight control has evolved from the Wright brothers until today. Wright 1903 Engine Talk A Power Point presentation prepared for students on 10 Apr 03 describing the operation of the Wright brothers' 1903 gasoline-powered, internal combustion engine. Three Power Point Presentations given at Wright State University, October 5, 2011, as part of Wright Brothers Day. Part 1. Background and Failures, Part 2. Success, and Part 3. Airplane Business. Wright Brothers Invention Talk A Power Point presentation prepared for the general public in Spring 2012 describing the invention of the airplane, the European Tour, and the Fort Myers Trials.